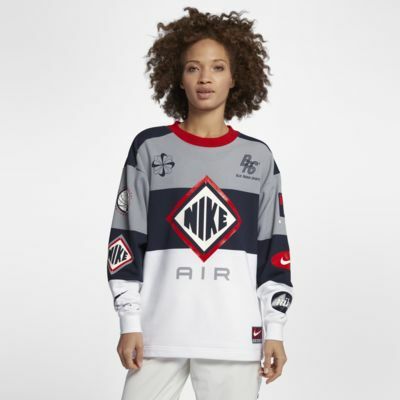 The Nike Sportswear Crew is a classic design with motocross inspiration, featuring ribbed details, a loose fit and contrast-colored graphics. Contrast-colored graphics are inspired by motocross racing. Love this. The material is amazing. The fit is great and the colors are vibrant. I spent weeks looking for a shirt or sweater to match a pair or Air Max and this shirt was made just for the sneakers. I want the other colors too.